Friends of the Office of State Archaeology, Inc. (FOSA) is a volunteer not-for-profit organization formed in 1997. The organization was formed by people concerned about support for the Connecticut Office of State Archaeology (OSA), which has a minimal budget for staff other than the State Archaeologist's salary. FOSA's mission is to enhance OSA efforts and help meet the numerous state-mandated responsibilities of the Office. Dedicated to supporting the efforts of the Office of State Archaeology (OSA), FOSA's mission is to help the OSA meet the office's numerous state-mandated responsibilities, and to enable the office to provide additional services to the state's towns, students, and other citizens. > Developing and facilitating educational activities to increase public awareness of the OSA and archaeological issues in general. > Encouraging participation by communities, institutions, corporations and individuals in supporting the mission of the OSA. > Encouraging partnerships between OSA scientific research initiatives and local communities. > Developing permanent sources of financial support and other public assistance for OSA efforts. 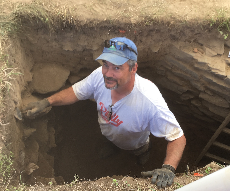 "The active participation of volunteer organizations, particularly FOSA, are critical to the ability of the Office of State Archaeology to accomplish its mission of preserving the rich archaeological heritage of the State of Connecticut. Their efforts are greatly appreciated." To learn more about the responsibilities of the Office of State Archaeology, how FOSA helps in this endeavor, and for a biographical sketch of Brian Jones, please click the "About Us" link. To access a copy of the latest FOSA Brochure, for review or printing, please click Brochure. To read an article by former State Archaeologist Dr. Nicholas Bellantoni on the challenges facing archaeologists and archaeological sites, please click: Awareness Article. These displays will change each day, with the entire group recycling at the start of the next month. If you can't wait, though, and want to see them all beginning with day-1, please click: DYK. You can make a difference for FOSA, even if you're not a member, if you shop on Amazon.com. FOSA is a registered charity with Amazon's foundation, Amazon Smile. For qualified purchases, a portion of your purchase (.5%) will be donated to the Friends of the Office of State Archaeology, CT. You may register for this program at www.smile.amazon.com. Registration is free and you will pay the same purchase price for your items. Beginning September, 2009, FOSA and the Archaeological Society of Connecticut (ASC) agreed to enter a closer association with each other, working collaboratively together in order to increase the public's awareness of Connecticut's archaeological past, in addition to our common aim of supporting the Office of State Archaeology. While both organzations remain distinct, the presidents of each organization will be attending the other's Board meetings, members from each will be encouraged to attend the other's annual meetings, and charges for attendance at one organization's events will be the same for members of the other organization. NOTE: In April, 2017, ASC webmaster Robyn Swan Filippone unexpectedly passed away. This had resulted in problems with the ongoing maintenance of the ASC website, which is now no longer available. We will, of course, assist in any way we can with getting the ASC website maintenance back up and running. Until such time as this happens, however, we will not be able to have a direct link to an ASC website. Among other things, Robyn's loss meant that recent ASC Newsletters, links to which had been posted in their website, became unavailable. As an interim measure, we suggested to ASC Newsletter Editor Lee West that we could post those unavailable ASC Newsletters on the FOSA website, this as a courtesy to our sister organization; an offer which Lee agreed to with thanks. Recently, back issues of the ASC Newsletters from 1939 through April, 2018 (v.247) were scanned and made available online to the public. As a result, newsletters which had been posted online here but which are now archived, have been removed from this listing. The non-archived group of newsletters is below. To access each newsletter, please click its associated link. In addition, Back issues of the ASC Bulletins from 1934 through 2014 have also been scanned and made available online to the public. Both the ASC Newsletters and ASC Bulletins archives can both be accessed by clicking ASC Archives. Beginning in late November, 2018, internet radio station iCRV ( internet Connecticut River Valley, accessible at https://icrvradio.com/ ) began discussions concerning the possibiliy of collaborating on a series of monthly radio shows, with the intent of highlighting the archaeological heritage of Connecticut and the efforts of OSA, FOSA and other archaeological groups to examine, understand and preserve it. This would be done under the general heading of "Connecticut Archaeology" on the iCRV website. It was felt that this would be of benefit to both groups. FOSA personnel have been highlighted in previous iCRV shows, though these discussions have been 1-off and not necessarily part of an overall theme. Following approval of the concept by the FOSA Board of Directors, work is currently moving forward on determining subjects of each of the monthly shows, as well as venue and participants. Where possible, we'll try to include images of artifacts and the layout of the site(s) being discussed. Once the shows have been aired, they would be available in the iCRV archives for about 3 months, after which we'd migrate copies of them to the FOSA website for more permanent storage and access. It's hoped that in this way, the profiles of both Connecticut archaeology and iCRV can be raised, to the betterment of all involved. > To see the current, tentative schedule of dates and subjects, please click Schedule. > To access recordings of completed shows, please click Shows. > Click Introducing iCRV for information on the story of the radio and its mission. > Click Things of Note for interesting tidbits of information on the station. > Click Listener Info for information on the listener audience that the station attracts. > Click Advertising Rates for information on the advertising rate packages used by iCRV as of May, 2018. > Click Scholarship Information for background information on the Cooke Scholarship. > Click Application Form for the form to be used when applying for the Scholarship. Please note that all documentation associated with the application should be saved and emailed, preferably as PDF files, to the address at the bottom of the Form. For questions about the Cooke Scholarship, please email them to fosa.ct.scholarship@gmail.com.